I paint the gay community because of their outness, their beauty, their honesty and their pain. Because of what they can say, what they feel they can't and how they can laugh at themselves. Because they have a unique perspective of being on the outskirts and looking away, in or forward. Because being discriminated against makes them stronger and weaker then most. I paint my shy sense of humor. I paint the power of a person. I paint the beauty and pain of a soul. I paint what I can't say. I paint the gay community because as an artist, a women, and a survivor, I feel the same way. Because I can relate. Susannah Elke Freed is the daughter of the late and renowned photographer Leonard Freed. All of the SUSANNAH’S PICKS Prints are Modern Silver Prints Signed on the Reverse by Brigitte Freed. 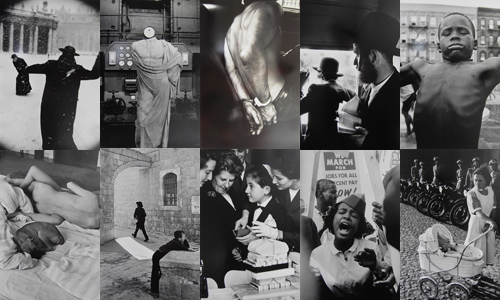 For information on Vintage and Later Silver Prints Signed by Leonard Freed please contact Ralph Brill at info@brillgallery109.com.